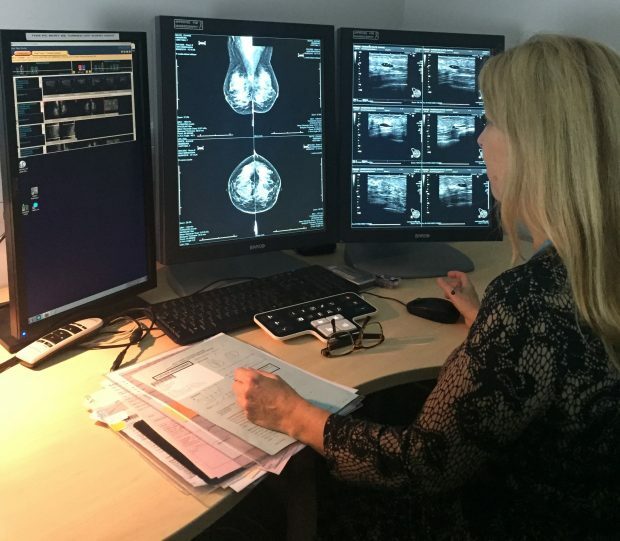 The NHS Breast Screening Programme has a history of helping skilful and ambitious radiographers progress in their careers. Qualified radiographers can progress to consultant level. This means they can run screening assessment clinics and undertake the roles traditionally undertaken by radiologists within the programme. Now, we are opening up another area of work – arbitration in screen reading – to radiographers who have the necessary skills and experience. Screening aims to detect breast cancer at an early stage before an abnormality can be found – and we find most cancers that are visible on a mammogram. All images are read by 2 trained film readers. If both of them identify an abnormality on the mammogram then the woman is normally recalled to an assessment clinic for further tests to obtain a diagnosis. Sometimes the 2 readers disagree on whether there is an abnormality and there are various ways of dealing with this. Some services always recall a woman to clinic if just 1 of the readers thinks further tests are needed to rule out cancer. Other services have an arbitration process to decide whether to recall the woman for further tests or to invite her again for routine screening in 3 years’ time. In some cases, 1 clinician has the ultimate say in this arbitration process while, in others, a group or panel of film readers decides on the case. Both methods have been effective in detecting cancers and returning women without cancer to routine recall. Following discussions, we have agreed that individual radiographers who possess the appropriate skills and experience can be involved in this arbitration process. This involvement can either be as individual arbitrators (third readers) or leading a panel of arbitrators. The new guidance on who can arbitrate is now available on GOV.UK.